Apostolis20 outlasted a field of 510 players to win the Hotter $215, $85K Gtd event for $18,048.36. At the time of this tournament, you could find apostolis20 ranked in 267th place in the PocketFives Worldwide Rankings and 20th place in the PocketFives Brazil rankings. 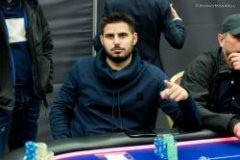 Prior to this tournament, the last time apostolis20 won a PocketFives tracked tournament was on Feb 22nd, when he won the PokerStars $82 NLHE [6-Max, Hyper-Turbo], $7.5K Gtd for $1,849.49. The average cash in this tournament was $1,146.07, with 9 players cashing for at least this amount. 8 PocketFivers from Brazil cashed in this tournament for $25,714.68. pandodora was the first PocketFiver to cash after the bubble broke in 10th place for $1,007.48. PocketFivers registered in 2012 cashed for $21,639.56, more than any other group of PocketFivers. PocketFivers cashed for $46,919.09 on the final table, or 46% of the total final table payout of $62,123.56. PocketFives tracked 826 tournaments on in the past 24 hours. PocketFivers cashed for $1,952,663.50 on during this time. Players who weren't members of PocketFives combined for $39,834.41 spread over 55 cashes.